I’m on a brief family trip to the Willamette Valley in Oregon. A couple of days ago, the temperatures were in the mid-90s F in the valley and in the 60s on the coast. To escape the heat, we made the obvious decision to visit the coast for the day. After the obligatory trip to the beach, I persuaded the troop to visit the Rogue Brewery and Pub in Newport. Rogue is a well-known producer of supposedly good beers. Somehow I had only sampled the Dead Guy Ale so I was eager to expand my horizons. The visit started well enough. You enter through a tall metal tower which looks like it’s been built from old beer storage vats. You can make howling noises and listen for the echo. A persuasive opening for two complaining children. 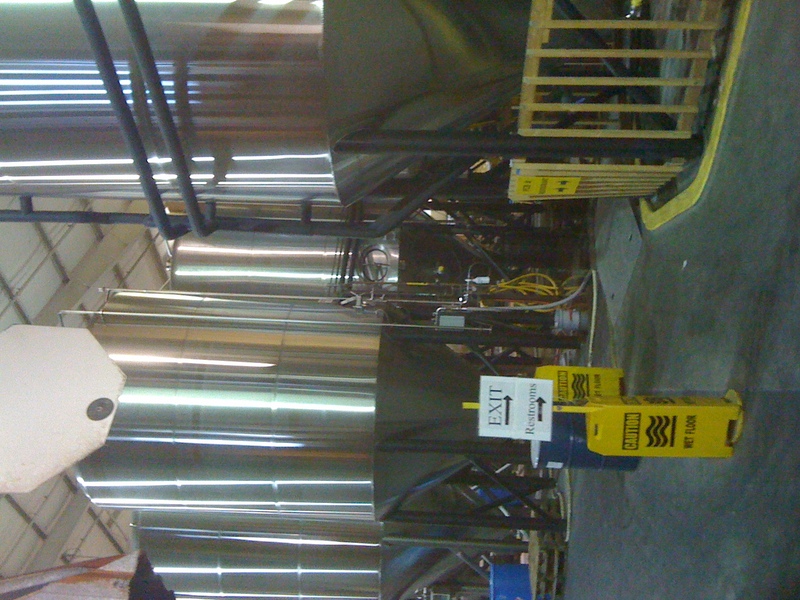 Then, you walk through the brewery itself before you get to the pub – see the photo. All the goodwill started disappearing when we got to the pub. The waitress couldn’t do justice to the 15 or so beers on tap and assumed we were already familiar with them. She wanted us to make decisions quickly and we had to slow her down. We settled for the samplers ($6 for four tastes) to get some idea of the beers on offer. Some of them were better than others. We enjoyed the Dry Hop Red and Yellow Snow IPA (ha ha). The Wheatbeer was weak, the Brutal IPA was not particularly brutal etc etc. You win some, you lose some so it was all forgivable. But what was unforgivable was the food. The clam chowder was O.K. but the rest was almost inedible. There’s lots of great seafood in Oregon and lots of great produce. With such great raw materials readily available, it’s criminal to put out food that could easily be English school lunch material. I’m definitely not coming here again and it’s put me off the beer. On the way out, we sang a chorus: “The beer is O.K., the food – No!” People coming in looked amused. Hopefully they were visiting for the brewery tour and not for an early dinner. If you’re ever in The San Diego area, Stone Brewery is quite good on both the food and beer fronts, and the restaurant and garden are beautiful. Thanks, Matt. I love Stone Levitation Ale. I’ve never been to the brewery and will definitely look it up next time I’m in San Diego.